Creating a Facebook page for your business is as crucial as having a website or a visiting card. People all around the globe can connect with your business for absolutely no cost. Having a Facebook business page gives you many advantages over other means of communication with your clients/colleagues. Reach a bigger audience free of cost. Not much time is consumed while broadcasting any message. Only one page manager can handle everything. People know that any message from your Business page is from an authentic source. You can advertise for free of cost for as many times and as long as you want. Now start creating a Facebook page by visiting this link. You will be presented with 6 classifications of Facebook pages. You need to choose the one your page falls in. This is helpful for showing your page in recommendations and searches to appropriate users. 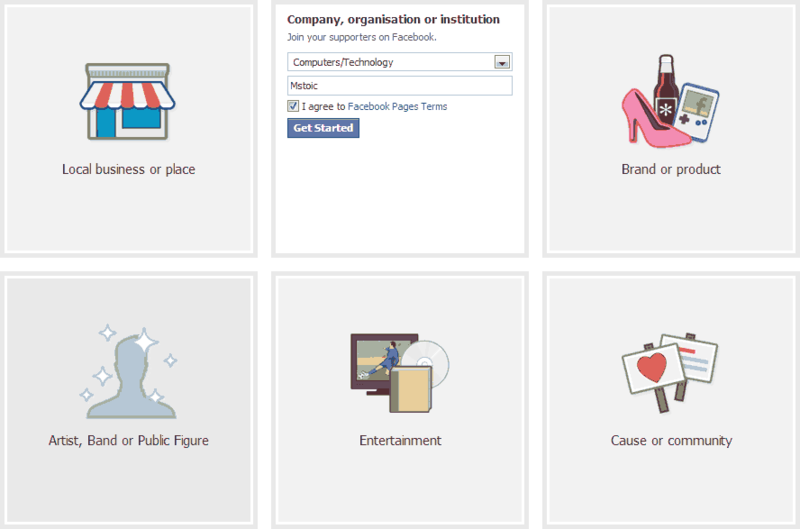 Local business or place: This option is for Facebook pages that belong to a business with a physical office. If you select this classification for your page, then you have to select the category of your business and type its details, like the Name of the business, address and phone number. Company, organization or institution: This category is for companies and institutions. You need to fill in your business name and choose the category of your company/institution if you choose this category. Brand or product: As the name suggests, this class is for any brand or product. If you select this option, then you have to choose a category for your brand/product and type its name too. Artist, Band, or Public Figure: This category is for individuals or group of individuals and you need to fill in the name and choose the category in which the artist/band falls. Entertainment: You need to choose the type of the entertainment and fill the desired name for your paged. Cause or community: This category is for any page that supports any cause or is for an online community. You need to fill the name of the cause or community if you select this category. NOTE You need to agree to the Facebook’s terms for pages for creating your Facebook page. Now you can fill all the information you want to show up on your page, fill everything you have to make your page rank better in Facebook search results. All the information you put here can be changed afterwards too. In the about section type the description of your page, type the website address if you have one and choose the Facebook web address for your page. Type the Facebook page address with caution, this can be changed only once after this. 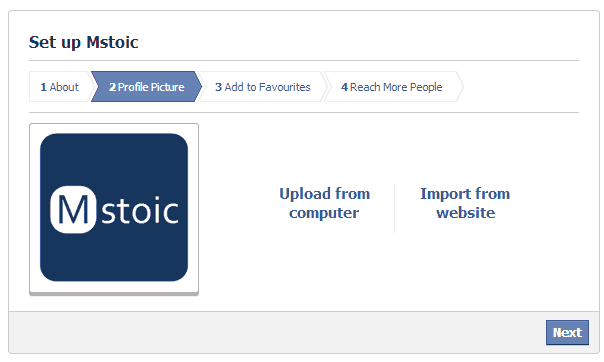 In the profile picture tab you can upload a profile picture for your page from your computer or import it from a website. The step is optional but is recommended. 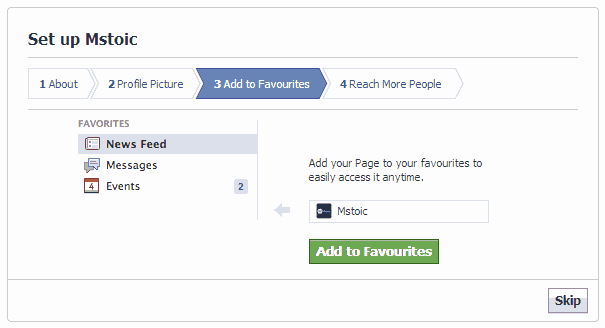 In the next step you can add you page to your favourites to reach it quickly from the Facebook homepage. 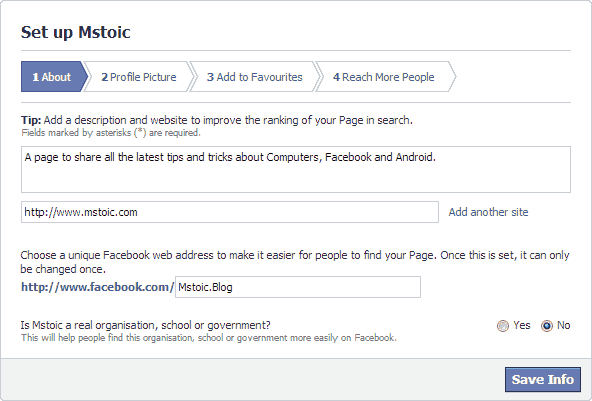 In the next step you can enable ads for your page. This will bring more likes to your Facebook page but you need to pay Facebook to enable them. Creation of your Facebook page is complete now. The first few things to make your page appealing are explained below. Make sure you cover them as soon as possible. The more likes your page has, the more it is going to receive. People like things that are liked by others, same is with the Facebook pages. 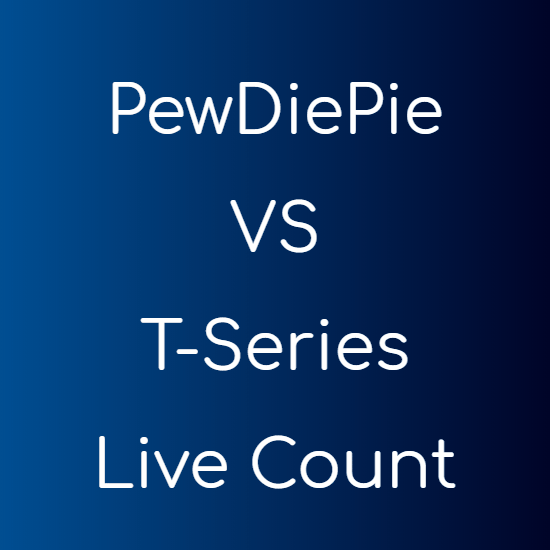 Upload a profile picture if you have not already done. This picture will appear in the news feeds whenever you post anything on your page. Make sure that it is relevant to your page. With the introduction of timeline, Facebook introduced cover photos. Cover photo is the first thing any user will notice after coming to your page. Make sure you make it attractive and attention grabbing. People like your page to receive updates from your page in their news feeds. Make sure you update your page and add new posts timely. Photos are the most engaging and are most shared, but don’t forget to experiment with your page’s audience. Facebook ads are really very effective and efficient if you are creating a Facebook page to get business. You can use Facebook ads to take Facebook users to your website directly or you can make them like your page, both of which are very crucial to spread awareness. If you find any problem creating your Facebook page, do let me know via comments. Creating a page in the Fb is one of the basic and essential step for any type of online business growth. Very well written and helpful post. Thanks for sharing it.